The following tasty, fragrant and moist cake, is a version of THIS cake, a recipe for which I’ve posted here five years ago. 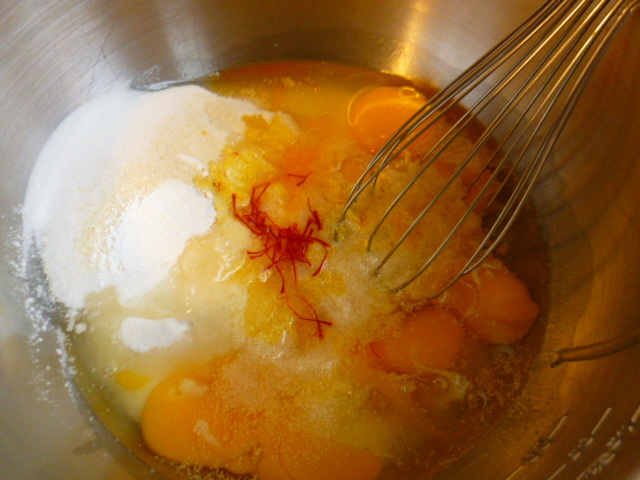 In the version I have here, I’ve decided to substitute the milk syrup with citrus-saffron one. 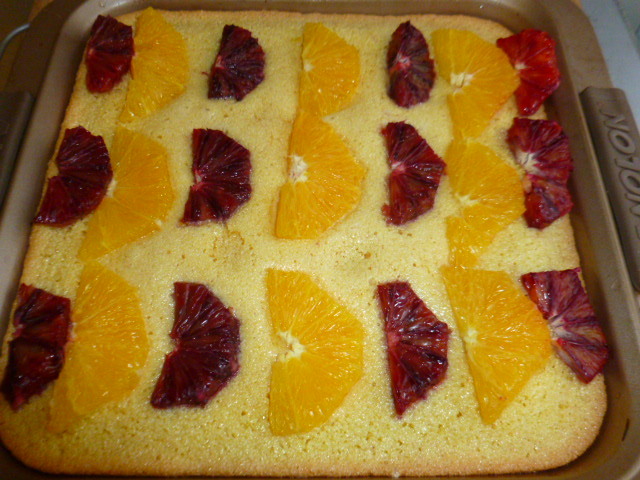 To enhance these flavors, I’ve also added saffron to the batter, and topped the cake with orange and blood orange slices towards the end of baking. 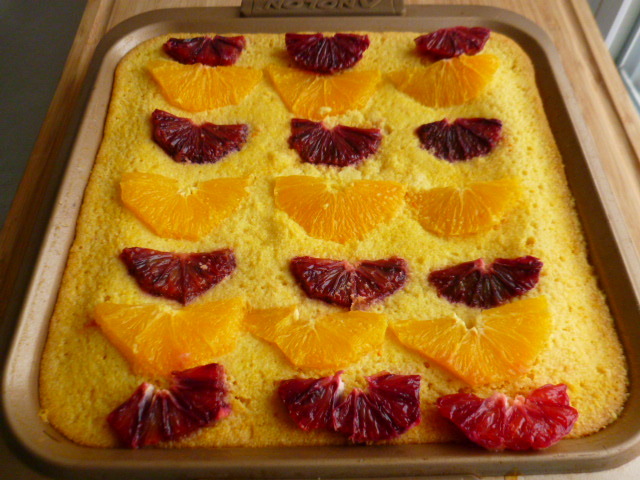 The saffron and citrus gave the cake a beautiful, deep yellow color, and amazing aroma. The cake was a great success and disappeared quickly. Try it and enjoy. * The original recipe calls for only 15 minutes of baking, as the cake was baked in a larger pan, therefore needed less baking time. 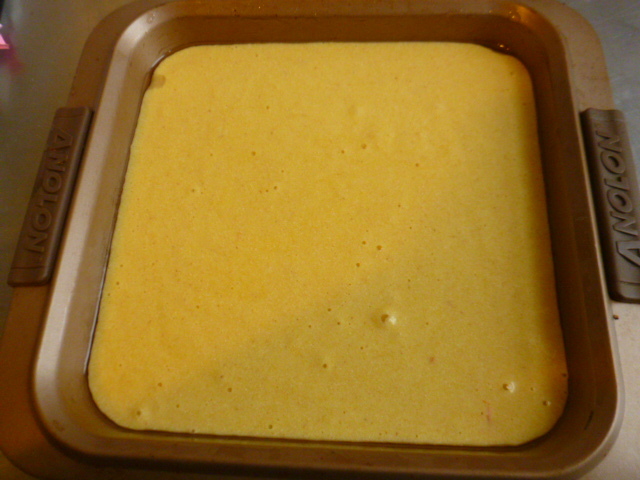 For baking the cake shown here in larger pan, follow the pan size and baking time from that recipe. 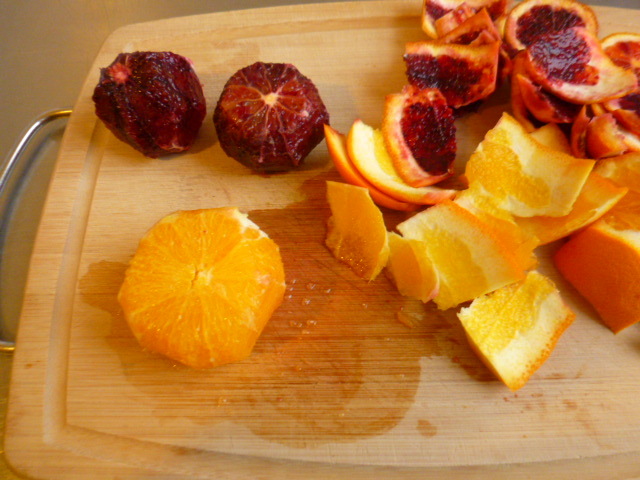 * If you can’t find blood orange, substitute with red grapefruit, or any other citrus fruit. 1. 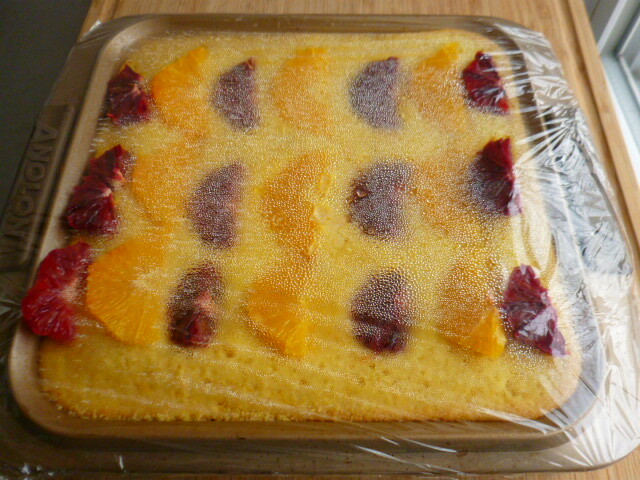 The cake: preheat the oven to 340F (170C). 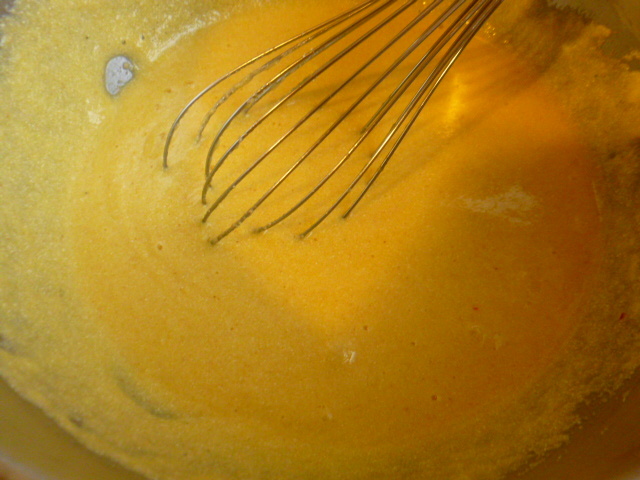 Brush the bottom of an 8×8” (20×20 cm) square pan with a thin layer of oil. Place the saffron threads in a small bowl and add the hot water. Let steep for 2-3 minutes. 2. 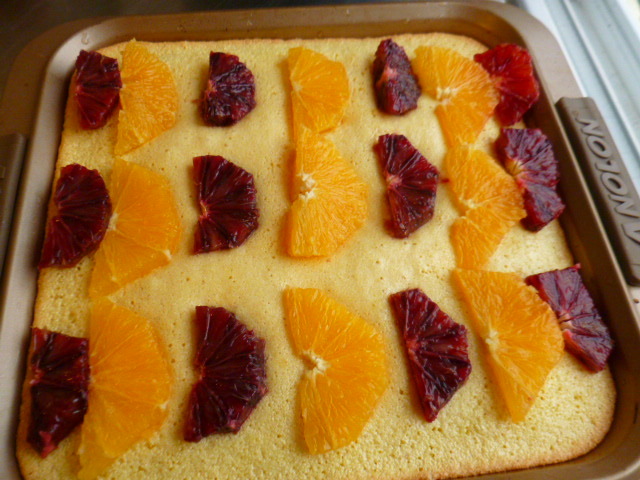 In a large bowl, mix all the ingredients for the cake, except for the oranges. Pour the batter into the pan and bake for 25 minutes. 3. 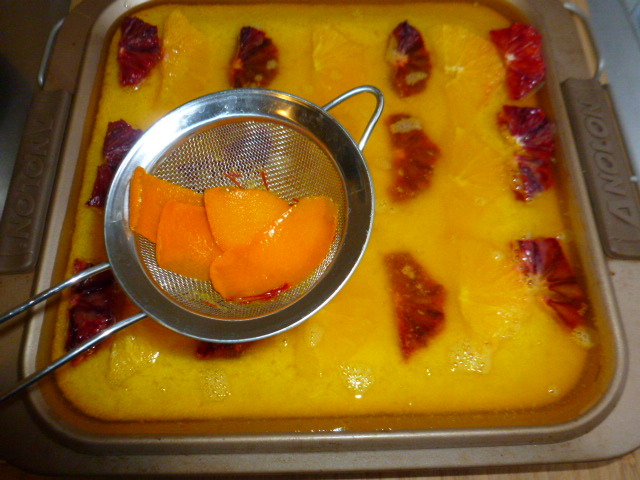 While the cake is baking, use a small sharp knife to remove the rind of the oranges, including the white part. Cut each orange in half and slice them. 4. Take the cake out of the oven and arrange the slices on top. Place back in the oven and bake for 5 minutes longer. Transfer to a rack, to cool to room temperature. 5. The syrup: combine all the ingredients in a medium size pot and bring to an almost boil. Reduce the heat to medium-low and cook for 5 minutes. Take off the heat and add the honey. Mix well and pour the syrup over the cake, through a fine strainer. Cover the cake with plastic wrap and bring to room temperature. 6. Place the covered pan in the fridge for at least 2 hours before serving. The cake will keep, covered in the fridge, for 3-4 days. My mouth is watering! That looks amazing! Awesome ! I just love the texture, color & flavor and it is so tempting that I would love to grab one !! Gorgeous cake, Ronit! I love the colors and flavors, especially saffron in it – brilliant! Oh my goodness, that looks divine!! Wow – what a beautiful yet simple presentation. Thanks! I feel like I can smell the cake from here it looks delicious. I will definitely have to try this very soon. It is a glass jar . . . so can see into it, but its location = ????? I remember having it when we were fulltime in our motorhome, but that was <2007! And . . . we’ve moved into two different homes since then! Love cake so much! This looks great! 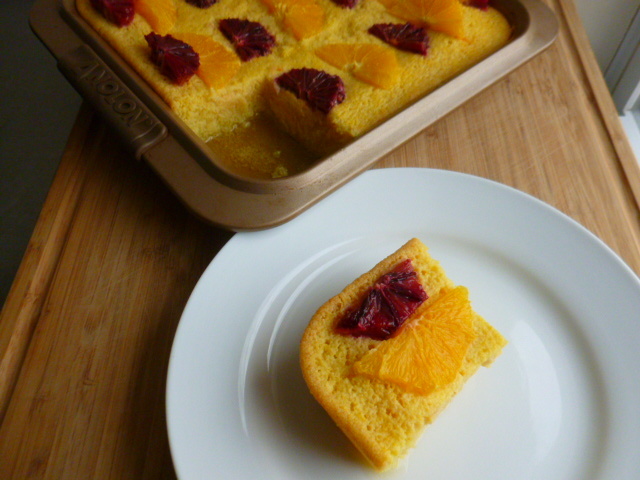 This semolina cake looks and sounds good. I like the blood orange. That’s a lot of eggs. So pretty Ronit. Great way to make use of the fruits. I can’t say I have ever baked any goods with saffron before but perhaps next time! I usually use saffron for savory dishes, but I’ve seen a few desserts that are flavored with saffron, so thought it would be interesting to try it, and it was! What an interesting cake! It sounds like it would be beautifully moist. I’ve never used saffron in any dessert, but the results seem to speak for themselves. Loved the recipe and the choice of ingredients. I am a big fan of semolina based cakes for its texture after baking, pretty soft and melt in mouth. Ronit, this is such a pretty cake! 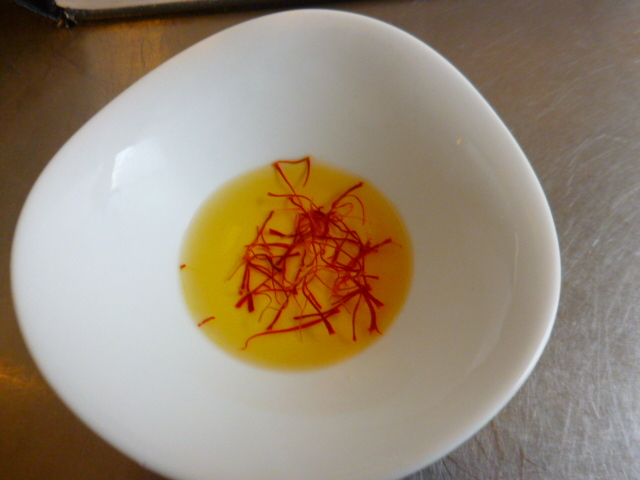 I love saffron, but have only used it in savory dishes. I have to try this! The colors and vibrancy of the cake jumped right out at me. I felt a need to reach out to the screen and see if it was available? :) Beautiful! Gosh this looks pretty! 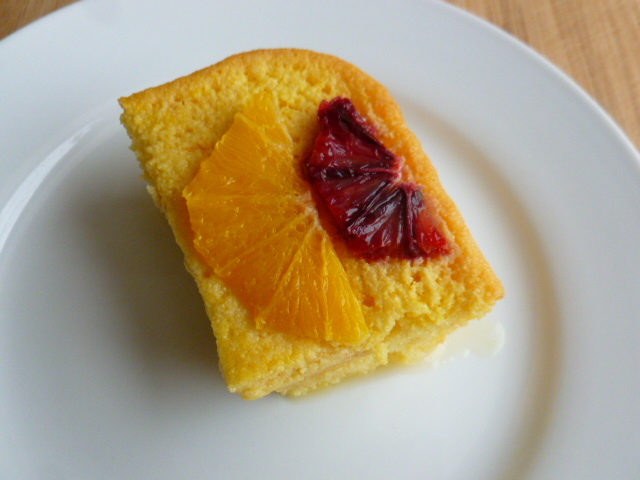 I adore citrus cakes of any kind and I imagine the combination of saffron, honey and orange would be amazing. 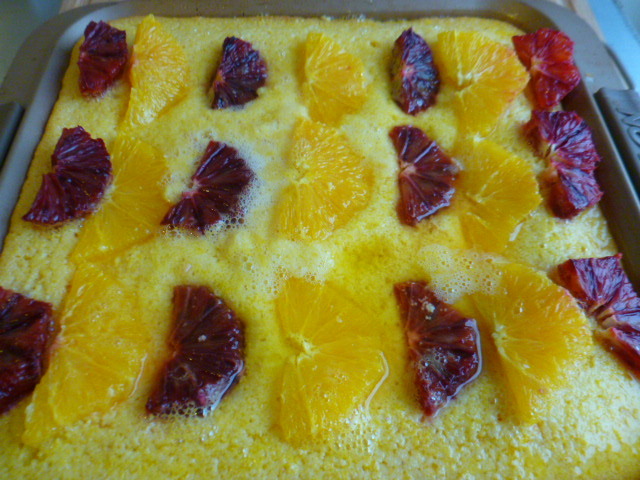 Wow This looks so good – I can only imagine how delicious the cake must be with the combination of orange and saffron! And it looks gorgeous too! 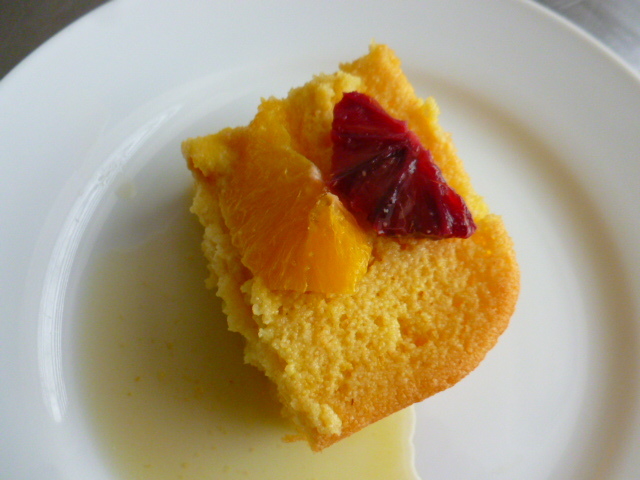 I love the texture of the semolina cake too. What a fantastic colour! I can almost smell the gorgeous fragrance! 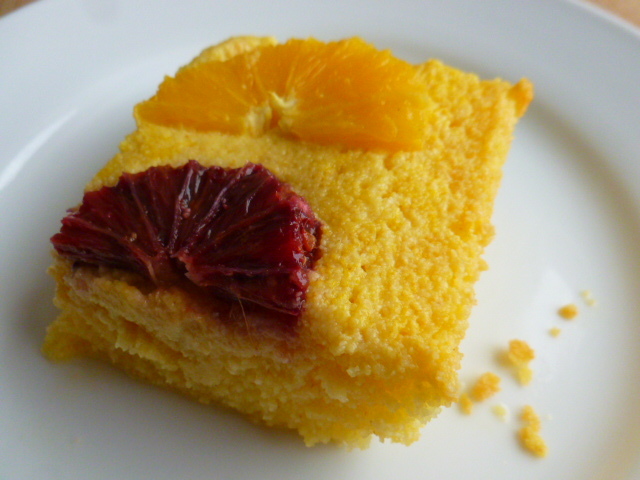 Wow, you have wonderful recipes of cakes on your blog and this one here is another wonderful creation, love the orange, saffron and the color in it! Is semolina and semolina flour same? I saw in stores semolina looks off white color and a bit granular in texture. So is this different from Semolina flour? Looks so moist and delicious. Well done!